This month features joint improvisations from the pianist, composer, and improviser Sylvie Courvoisier — whose music seems “to be realigning the cosmos” with its “power, eloquence, and ingenuity” (All About Jazz) — and drummer and composer Andrew Cyrille — “a great drummer, a fine writer, and a wonderful bandleader; you pass him by at your peril” (Penguin Guide to Jazz). Together, these two magnificent artists will play their own and each other’s music, building up unforgettable soundscapes in this dazzling evening of brilliant jazz. 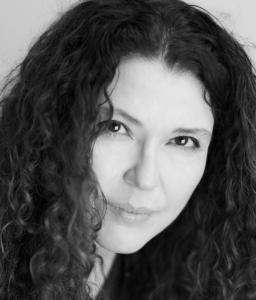 Sylvie Courvoisier is a pianist, composer, and improviser. Born in Lausanne, Switzerland, Courvoisier moved to New York in 1998 and has lived in Brooklyn since that time. Courvoisier has led multiple groups over the years and has recorded 8 albums as a band leader and 50 albums (25 as a co-leader and 25 as a side-person) for different labels, notably ECM, Tzadik, and Intakt Records. She has been commissioned to write music for concerts, radio, dance, and theater. Since 1996, she has been touring widely with her own groups and as a side person in USA, Canada, Japan, Australia, and Europe. Courvoisier has performed and recorded with John Zorn, Mark Feldman, Yusef Lateef, Ikue Mori, Tony Oxley, Mary Halvorson, Ingrid Laubrock, Tim Berne, Joey Baron, Joëlle Léandre, Herb Robertson, Butch Morris, Evan Parker, Ellery Eskelin, Fred Frith, Nate Wooley, Tomazs Stanko, Susie Ibarra, Wadada Leo Smith, and the flamenco dancer Israel Galvan, among others. Since 1998, Courvoisier has performed regularly solo and in duo with Mark Feldman. Currently, she is the leader of her own trio with Kenny Wollesen and Drew Gress. Courvoisier is a co-leader of the Miller‘s Tale quartet with Evan Parker, Ikue Mori and Mark Feldman. Since 2000, she has been a member of Mephista, an improvising collective trio with Ikue Mori and Susie Ibarra. Courvoisier regularly performs in a number of John Zorn’s groups and compositional projects including Cobra and the Bagatelle Marathon. Since 2010, she has been working as a pianist and composer for flamenco dancer Israel Galvan’s project La Curva, with more than 150 performances around the world. Galvan and Courvoisier are working on a new project called Cast-a-net with Evan Parker, Mark Feldman, and Ikue Mori which will debut in the summer of 2018. Her most recent albums include her trio D’Agala on Intakt (2018) with Kenny Wollesen and Drew Gress; her duo Crop Circles with Mary Halvorson on Relative Pitch Records (2017); Miller’s Tale, a collective quartet with Mark Feldman, Ikue Mori, and Evan Parker on Intakt (2016); and Salt Task, a collective trio with Chris Corsano and Nate Wooley on Relative Pitch Records (2016). 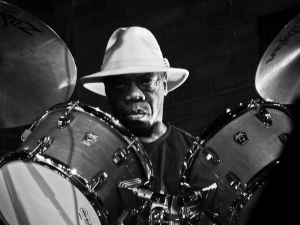 Master drummer and composer Andrew Cyrille began studying science at St John‘s University while playing jazz in the evenings. He began formally studying drums and composition first with Philly Joe Jones in 1958, and later at The Juilliard School and Hartnett School of Music. At that time, he also performed with artists ranging from Mary Lou Williams, Coleman Hawkins, Roland Hanna, and Illinois Jacquet to Kenny Dorham, Freddie Hubbard, Walt Dickerson, Rahsaan Roland Kirk, and Nigerian percussionist Babatunde Olatunji, among others. Beginning in 1964, Cyrille’s 11-year iconic collaboration with pianist Cecil Taylor would define the category of free jazz drumming and establish Cyrille in the vanguard of jazz drummers and percussionists. In 1969, Cyrille formed several percussion groups featuring notable drummers such as Kenny Clarke, Milford Graves, Famoudou Don Moye, Rashied Ali, Daniel Ponce, Michael Carvin, and Vladimir Tarasov. Since leaving Taylor’s group, he went on to work with formidable artists as David Murray, Muhal Richard Abrams, Mal Waldron, Horace Tapscott, James Newton, Peter Brötzmann, and Oliver Lake. Cyrille was the drummer on Billy Bang’s A Tribute to Stuff Smith, notable for being Sun Ra’s last studio session. From 1971-1973, Cyrille was artist in residence and instructor at Antioch College, OH, and also taught at the Graham Windham Home for Children in New York. He is currently on faculty at The New School’s School of Jazz in NYC. In 1994, he released an educational video, Jazz Methodology in Drum Music: In and Out of Meter, based on nearly 100 jazz albums and 30 years of Cyrille’s professional jazz drumming with artists like Cecil Taylor, Anthony Braxton, and others. A prolific and indefatigable composer and performer, Cyrille released Declaration of Musical Independence on ECM records in 2017, and has a forthcoming release in 2018. Cyrille has toured and performed throughout North America, Europe, Africa, and the former USSR. He formed Haitian Fascination with Haitian percussionist Frisner Augustin and guitarist Alix Pascal, and for over 27 years has been a member of TRIO3, featuring Oliver Lake and Reggie Workman. He leads his own groups in various formations and performs in duo, trio, and larger configurations (big bands) with luminaries such as Archie Shepp, Roswell Rudd, Marilyn Crispell, Bill Frisell, Richard Teitelbaum, Irene Schweizer, Dave Douglas, Joe Lovano, Jason Moran, Vijay Iyer, David Virelles, Bill McHenry, Ben Street, Henry Grimes, William Parker, Soren Kjaergaard, and others. In addition to Andrew Cyrille’s 21st Century Big Band Unlimited, his most recent big band performance was with Mark Masters’ American Jazz Institute Ensemble. Cyrille is a Guggenheim Fellow in Composition (1999). Other notable achievements include three National Endowment for the Arts grants for performance and composition, two Meet the Composer/ AT&T- Rockefeller Foundation grants, and an Arts International Award to perform with his quintet in Accra, Ghana, and West Africa, and two ASCAP awards for meritorious achievement in percussion composition.